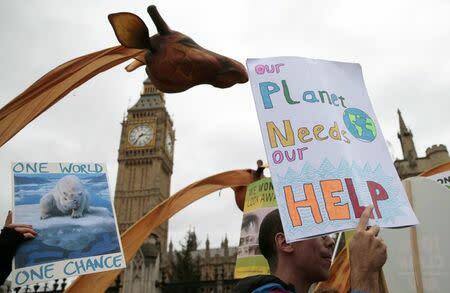 LONDON (Reuters) - Britain needs to put a carbon emissions limit on power plants bidding for back-up capacity contracts as an auction last week laid bare the contradiction between support for dirty emergency power stations and ambitions to tackle climate change. Britain is dangerously close to experiencing blackouts due to a lack of new power plants and it has set a 2025 deadline to close all coal-fired plants to help meet its carbon reduction goals. In a policy reset, Secretary of State for Energy and Climate Change Amber Rudd last month spoke of the need for new gas-fired plants to fill the void, saying this was the cheapest way to clean up the power sector and ensure the lights stay on. But a support scheme, also known as the capacity market, put in place to provide an incentive for the construction of new plants, especially gas-fired ones, is still not lucrative enough as Friday's weak capacity auction price showed. Just one new gas-fired station secured a capacity contract in the auction and a further 5.1 GW of new gas capacity failed to gain contracts. Instead, more than 1 GW of carbon intensive diesel-fired power generators and 4.4 GW of coal-fired plants won contracts, undermining Britain's claim to be at the forefront of global efforts to cut emissions at last week's U.N. climate deal negotiations in Paris. "The current auction rules will likely need to change and potentially include a form of emissions standard in order to qualify for a contract," said Phil Grant, partner in the energy practice at consultancy Baringa. The Institute for Public Policy Research, a British think-tank, said the limit for generators obtaining 15-year capacity contracts should be set at 450 gramms of carbon dioxide per kilowatt hour (gCO2/kWh), a level which would effectively rule out coal and oil-fired plants but allow gas plants. Poor market economics for gas-fired power plants, which emit half the amount of carbon spread by coal plants, means owners have been announcing gas plant closures rather than plans to build new ones. Utility Centrica was the latest company to confirm one of its gas plants would close next year. Front-month clean spark spreads, the measure of profitability for a gas plant once fuel and carbon costs have been taken into consideration, are currently around 4.5 pounds per megawatt-hour (MWh), way off the 8-9 pounds/MWh analysts say is needed to justify new investment. Another flaw in Britain's capacity auction is that it requests too much capacity, flooding the auction process and essentially weighing down the final price, analysts said. "It is our belief that the government will be forced to tweak the parameters for the next auction, resulting in higher prices and some credible new build projects entering the fray," said utility analysts at Bernstein. They estimate power proucers Drax, SSE and RWE npower are most exposed to revenue linked to capacity market contracts. The government has already said it will make proposals next year to improve the capacity market after a two-month consultation that closed last week. "I am clear we want to move away from diesel and I have said we will review the capacity market auction after this one has concluded to ensure in the future it includes gas," Rudd told a parliamentary hearing on Wednesday. The plans to forge ahead with new gas plants have come under scrutiny from green groups after a global climate agreement struck in Paris sets the course for a historic transformation of world economies away from fossil-fuels. Under the Climate Change Act Britain already has a legally binding target to cut emissions by 80 percent on 1990 levels by 2050. They have already fallen by around 36 percent and to achieve the goal the government sets five-yearly carbon budgets. A recommendation by the Committee on Climate Change (CCC), which advises the government on climate issues, said in order to meet the fifth budget, from 2028-2032, it should reduce emissions from the power sector to below 100 gCO2/kWh in 2030. This would limit new gas-fired power unless they are fitted with technology to capture carbon emissions and store them underground or else as back-up for intermittent renewables. A billion-pound scheme to help commercialize carbon capture and storage (CCS) was abandoned by the government in last month's spending review, while subsidies for renewables have been slashed this year. "The Government knows it has made a mess of energy policy ... The success in Paris provides a clear opportunity to 'reset the reset' with a modicum of honor and get us back onto a safe, low cost, low carbon energy future," said Nick Mabey, chief executive of climate policy think tank E3G.